Thaw the frozen green beans. Slice the Tofu into 1 inch thick strips. Take the nonstick pan and add oil to it. Once the oil is hot, place the tofu in the pan. after 2 min turn them so that the tofu is fried on all sides. Keep the tofu aside. Meanwhile boil 2 cups of water in the pot. add salt to water. Once the water is boiling add the beans to it. After 4 min turn off the heat and drain the green beans and run under cold water. (This step will prevent from discoloring your green beans). Heat the same non stick pan and add the sliced ginger and minced garlic. Add soy sauce and green beans to the pan. Add sliced almonds. Add the tofu to the pan , add black pepper followed by red chili sauce. Mix all the ingredients well gently and add the sugar at the end. That's it, Yum! Yum! Green Beans Tofu Stir Fry is ready. Serve Hot Over Noodles or Rice. OR Eat this as a Veggie Snack. I toped with oatmeal and ate it still sounded yummy. Sugar is the secret ingredient in this recipe. You can replace the Sugar with Honey for the sweet and sticky effect. 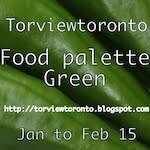 I am sending this entry to Torviewtoronto's Food Palette Green Event.